In 1834 Thomas Babington Macaulay accepted an invitation to serve on the recently created Supreme Council of India, foreseeing that he could save from his salary enough to give him a competence for life. He inaugurated a national system of education, Western in outlook, and as president of a commission on Indian jurisprudence he drafted a penal code that later became the basis of Indian criminal law. In a bid to keep Indians away from cultivating their own culture, Macaulay, in 1835, advocated that Indians should proliferate western education system in British India. The result was a ghastly blow to Indian researches in various field including science and language. He very well knew that there were countless dialects in India and it would be a near impossible task to administer them. His vicious effort alienated us from our very own indigenous culture, science, technology & even history. The outcome was a deadly one, Indians were uprooted from their cultural base but failed to adapt to the foreign culture. They were left languishing in between aping something that had destroyed the basic identity. With Governor-General of India, William Bentinck giving a nod to the policies of Macaulay, Indian language and culture were sent to rot. Not much has changed since then. Our overall lifestyle has been anglicized. 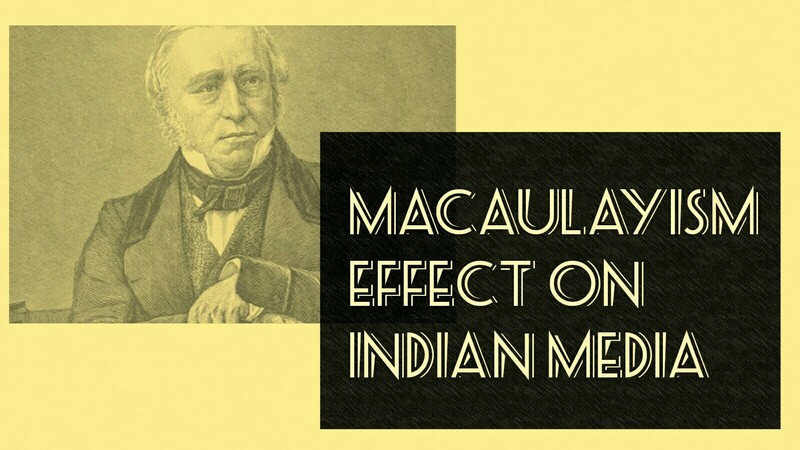 Ripples of the Macaulay effect was also felt in the globalization of Media in India. Despite an exponential growth in the Indian media industry, it failed to showcase its cultural history. The rapid growth of Indian economy with its middle-class aspiring for a western lifestyle was alluring for foreign players to explore the market. India was graduating into one of the biggest English-language media software markets. So, it was obvious for them to make inroads into the media which was once considered to be a tool for educating the masses. With more and more foreign media players intruding into the Indian media industry, television channels started using metropolitan languages for broadcasting. Foreign program formats like reality shows caught the fantasy of the Indian audience. The Indianized version of the shows had non-Indian languages, codes, and conventions. Mahabharata, Ramayana, Malgudi days lost the charm and was replaced by programs which used street-smart language. Macaulay’s dream was fulfilled by channels like MTV and Channel V who wiped away Indian languages and introduced the usage of ‘Hinglish’ (a mixture of Hindi and English). The effect was the creation of a generation who started thriving on a fake and borrowed culture. There were obvious reasons for the media tycoons to choose a foreign language for broadcasting. They wanted to spread their content across the whole of India and making programs in several languages was expensive. and for that they bombarded the use of a pro-English dialect that was neither completely British not completely Indian. Commercialisation became so rampant that marketing policies began controlling news content. English channels created a notion that they are authentic and erudite. Their popularity rose to such heights that people began keeping English news channels switched on for all the time. Discovery channel also thrived on Macaulay’s principles. They spread the propaganda that they aired educative content. However, their content initially focussed only on global topics and very less on Indian perspective. It became a runaway success as Indian proudly claimed that they watch nothing but the Discovery channel. It is indeed regrettable that no government took any initiative to create content that would highlight Indian culture justifying the fact that Macaulay was right that for the development of an “illiterate nation” English has to be propagated. The plague of western culture has crippled me to such an extent that I am compelled to use a foreign language to try and find out how Macaulay implanted the seeds of a foreign culture that have flooded the media which has become a part of our livelihood. Previous Article What Constitution Says About ‘Religious Minority’ ?